What’s the deal with Brigham and Women’s Hospital or Harvard Medical School when it comes to the retracted STAP cell papers? I was just writing yesterday in part about how we haven’t really heard anything (news, statements, etc.) from those places about the whole STAP cell mess. In contrast, in Japan and at RIKEN there has been a non-stop flood of news and developments involving STAP. Now today I’ve heard from a source that senior STAP cell paper author, Dr. Charles Vacanti, will be stepping down as Chair of the Department of Anesthesiology in a couple weeks. He indicated this decision in an email to his departmental colleagues. It is formally possible that this may not linked to the whole STAP cell situation, but there could well be a connection. 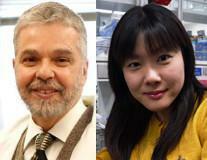 Vacanti was not only the senior author on the STAP cell Nature article, but was also the key mentor to STAP first author, Haruko Obokata (both pictured above). According to the email (pasted below) that he recently sent out to his colleagues, Vacanti is also going on a 1-year sabbatical to, in his words, “contemplate my future goals…” If his institution is investigating STAP, one might well expect the conclusion to come during that sabbatical period. Again, there are a lot of ‘ifs’ here. I would note from Vacanti’s email that he does indeed have a great deal to be proud about for his department as they have done amazing things during his tenure as Chair. It is with somewhat mixed emotions that I share with you my decision to step down as Chair of the Department of Anesthesiology, Perioperative and Pain Medicine, effective September 1, 2014. When I accepted the position in 2002, I anticipated serving as Chair for a period of 10 years, having a vision of what I hoped to accomplish during that time. I approach the age of 65 next year having served as Chair of two anesthesia departments – UMASS then BWH – over the last two decades. I have always felt that a leader is most effective during the first decade of service, after which time there can be diminishing returns on the energy invested in the challenges faced. I feel that is certainly true in my case, and that by this measure, I am two years past due in making this decision. I am very proud of what we have accomplished as a department over the last 12 years. We have matured, expanded and reorganized to meet the demands of a changing environment. Our department now provides anesthesia services to patients on four campuses, including 850 Boylston, the BWFH and Patriot Place. We now provide non-operative anesthesia services to almost 10 times as many patients as we did in 2001. Since 2002, the number of full professors in our department has more than doubled, as have the number of departmental endowments, with external funding of our research almost tripling despite the overall decline in availability of federal research dollars. This has resulted in roughly 100 original peer reviewed scientific publications each year. Our Residency program continues to be among the most competitive in the country. Our Pain Management program is a nationally recognized Center of Excellence. Several of our divisions, including Cardiac Anesthesia and Obstetrical Anesthesia are arguably the most respected in the country, and I believe we have developed the preeminent pre-admission test center for patients scheduled to undergo a procedure involving anesthesia services. We have also tripled the number of CRNAs on our staff, enhancing our ability to efficiently provide the safe, compassionate care to our patients. I plan to take a one-year sabbatical to contemplate my future goals, redirect my efforts and spend time doing some of the things that I enjoy most. When I return in September 2015, I hope to focus a significant portion of my academic efforts on Regenerative Medicine and mentoring the next generation of anesthesiologists. Dr. Nabel intends to convene a search committee for my successor. In the interim, Bhavani Kodali has graciously agreed to serve as interim Chair. I am extremely proud of this department, and the quality of our faculty, residents, fellows, CRNAs and staff, not only as professionals, but more importantly, as people. It has been a pleasure serving in this department and I am grateful to have been part of it. I would like to thank each and every member of our team for their wonderful contributions. I sincerely appreciate the support you have given to me as Chair. Had my discoveries (see more at http://science4truth.wordpress.com ) being respected by the mainstream journals and had Nature being truly scientific in reviewing STAP papers then this tragic incidence would not happen at the beginning. Now two heavy-weight STAP cell players are gone (one forever and one temporary) who will repeat the STAP cell discovery? Why do you (XXXX) think your discoveries belong in Science, Nature or Cell? There are thousands of journals out there. Are all of those not good enough for you? XXXX Everyone gets rejected from NCS journals, even Nobel Prize winners. Who is going to repeat the STAP cell discovery?